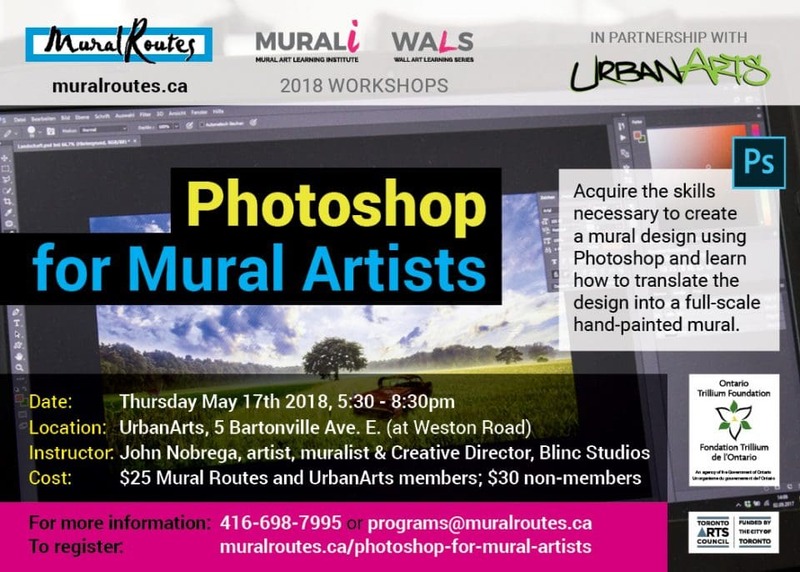 Acquire the skills necessary to create a mural design using Photoshop and learn how to translate the design into a full-scale, hand-painted mural. Note: Computers and Photoshop programs will be provided during the workshop. If you would prefer to work on your own laptop with Photoshop, and can bring it to the workshop, please indicate this in your registration. years. Working with Allan Bender he has helped establish Blinc Studios as one of the premier Mural painting companies in Ontario. Their clients include the Toronto Zoo, Chinatown BIA, Queen St West BIA and Port Union res.Com. As a fine-artist, John has also shown extensively in Canada, with works in many private and public collections including at the Agnes Etherington Museum in Kingston and the Museum of Contemporary Canadian Art in Toronto. This workshop is being held in partnership with Urban Arts.